Monday’s defeat of 4-1 by the Oakland A’s was surprising seeing as we had Madison Bumgarner on the mound. He managed to give us 7 innings but gave up 4 runs making our first game of this short road trip a bummer. Today the much-anticipated ML debut of Mike Kickham wasn’t what we were hoping for and we suffered a 6-3 loss against Oakland tonight leaving that bad taste in my mouth I get whenever we lose to the A’s. The handsome 24 yr old lefty peered out through his spectacles as he became one of 10 Giants to make his major league debut as a starting pitcher under GM Brian Sabean. I kept waiting for him to change from Clark Kent to Superman even though it never happened it was easy to imagine. The horned rimmed glasses made for an uncanny resemblance to Kent’s disguise that to this day fools nobody. Kickham appeared a dead ringer for the mild-mannered Kent who would at any moment duck into the booth and reappear as Superman. None of us doubted it as he started out with a 1-2-3 inning throwing a 94 mph fastball that got us Giants fans all excited. The phone-booth never appeared for young Kickham and in the second inning the wheels started to fall off as he gave up a 2-run homer to Norris. I was fairly certain the rookie was feeling a bit gun-shy after that and feared his nerves would get the better of him. It appears I was right. Eric Surkamp underwent Tommy John surgery and placed on 60 day DL. Santiago Casilla underwent knee surgery to remove a cyst return is possible for July but according to Casilla he doesn’t plan to return until after the All Star break. The mystery surrounding who was going to fill the slot left by an injured Vogelsong was praying on the minds of most SF Giants fans, but my faith in Bochy left me feeling surprisingly relaxed about the situation. 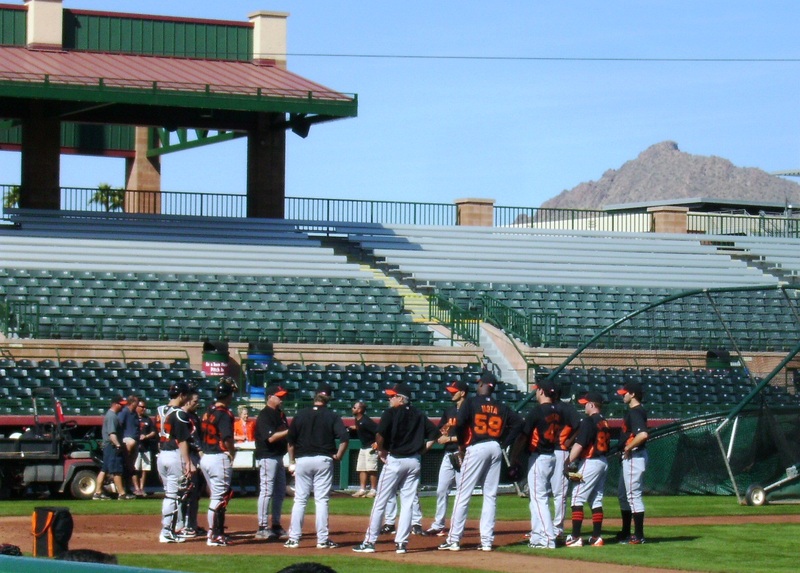 After all, I saw some good pitchers work out in February while at Scottsdale Stadium and I just assumed we had some good choices. Excited for Kickham and assuming he was on the mound for a reason I was expecting to see an exciting debut. Perhaps I was living in some sort of unrealistic fantasy but I wasn’t the only one. In the third inning after Kickham had managed to load up the bases with only one out Bochy left him in and it turned out to be a disaster. During his very short debut Kickham gave up four earned runs in 2 1/3 innings and all of a sudden I stopped waiting for that phone booth to appear. Still I feel that it will be a shame if we don’t get to see more from this young man. I think after the stress of a first outing such as tonight’s wears off he may very well have some good stuff to offer. After are new starter was removed from the game Kontos and Lopez each had brief visits to the mound and then Gaudin came in followed by Mijares. Committing no errors which is always a pleasant surprise given some of the season’s less than tight performances the Giants bats were obviously sleeping through most of this game. With just 6 hits tonight the Giants scored a less than giants size total of 10 hits during our little visit to Oakland. Scutaro singled and doubled as the designated hitter and Pence homered in the 9th trying once again to win the game by himself. Too little too late or perhaps we could have pulled this one out of the hat. I don’t think the A’s will look quite as scary back home at AT&T but we will once again be on familiar territory, the uphill climb. But we can do it, we have before, and we will again. Bay Area Sports Guy – A’s knock out Kickham early, keep Giants’ offense at bay. Extra Baggs: Fond memories of Barry Zito’s thrilling debut start, etc. OAKLAND – “Mike Kickham joined Matt Cain, Madison Bumgarner and Tim Lincecum in a club of sorts Tuesday night, albeit one that doesn’t dole out handsome jackets. None of them won their first big league start.